Dried Fenugreek Leaves are commonly found in India where it is used both as a herb(leaves) and a spice(seeds). It has a characteristic smell. The dried leaves or Shoptsa are used to flavor breads in the Amdo region of Tibet. Growing up in India, during the summer when Fenugreek leaves are abundant in the market, we would leave them to dry in the sun, and then grind into powder to store for later use. 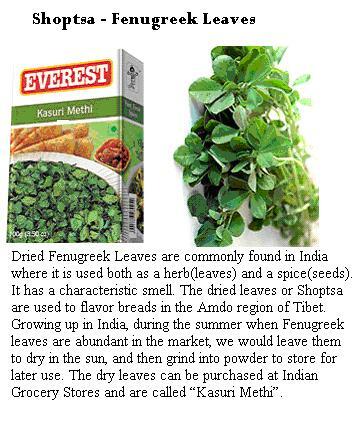 The dry leaves can be purchased at Indian Grocery Stores and are called “Kasuri Methi”. Emma is a Tibetan spice, commonly known as Szechuan pepper or Sichuan pepper. It is the dry berry husk of the prickly ash tree – it has a unique numbing quality and adds wonderful flavor to meat dishes. If you don’t have it on your spice rack, then just omit it from the recipe and add some black peppercorn instead. I don’t know any place to buy it online but if you are NYC, you can ask at one of the tibetan restaurants or shops in Queens. 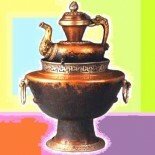 Tashi Delek Do you knowwhere to buy droma in nyc area or online. my husband is amdo and his mother calls fenugreek leaves “Kortse”. I notice that people are using a lot of MSG(Monosodium Glutamate)/Ajinomoto in the Tibetan Food (especially Lephin and Momos) that is widely available at Majnu Ka Tila, which is very bad for Health. I just wish to know if MSG is actually a key ingredient in Tibetan Food? What is Emma spice ?